Russian cosmonauts Sergey Prokopyev and Oleg Kononenko will conduct a spacecraft to investigate a hole in the hull of the spacecraft Soyuz MS-09, which is docked to the International Space Station (ISS) on December 11, told the Russian space organization Roscosmos Sputnik on Saturday. “The extravagant activity of the Russian cosmonauts is scheduled for December 11,” the spokesman said that the specific time and duration of spacecraft had not yet been established. Prokopyev, the master of Soyuz MS-09, is currently commissioned by ISS, while Kononenko is planning to fly there on December 3. 0 spacecraft with Ovchinin and US astronaut Nick Haag aboard in October. It was then decided that the next Mission, including Kononenko, the Canadian astronaut David Saint-Jacques and the American astronaut Anne McClain, will fly to the ISS before the schedule to leave the station unattended and ensure that the survey of the hole in Soyuz is carried out . 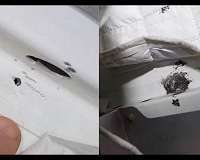 19659002] The small crack on the hull of the Soyuz spacecraft was found after an air leak occurred on the ISS at the end of August. The cosmonauts then patched the hole, while Roscosmos and spacecraft manufacturer Energia have launched probes to determine how the hole occurred. Energia suggested that the hole had been deliberately made. Roscosmos, in turn, caused a manufacturing error as the cause of the incident, which led to the US space agency NASA suggesting that the error had not been deliberately caused. Roscosmos boss Dmitry Rogozin said in early November that the hole in the hull of Soyuz could have been drilled before the launch at the space center Baikonur. We need your help. SpaceDaily News Network continues to grow, but revenue has never been harder to keep. With the advent of Ad Blockers and Facebook, our traditional revenue sources continue to decline through quality networking. And unlike so many other news sites, we do not have a paywall – with the annoying usernames and passwords. If you find our news pages informative and useful then please consider becoming a regular supporter or to make a one-time payment.